Wondering if enterprise customers actually read the due date on their invoices? If you’re like most usage-based suppliers, late payments from your largest customers has become the new normal. But with 50%+ of business revenues tied to this segment alone, these past due invoices are having major impacts on financial performance and operations. Finance teams are spending countless hours re-invoicing for outstanding balances. Account teams are tracking down payments instead of new revenue opportunities. And leadership is frustrated with the inability to accurately depict and forecast performance. So why are your enterprise customers falling into the past due status? Is it lack of funds? Overlooked invoices? Trying to extend their days payable outstanding? For the majority, it’s none of the above. It’s your invoicing that’s causing the delay. Look at it from a consumer’s point of view. You receive your invoice, whether it be paper or online, validate the charges and make a payment. Simple, and often times, automated. But as you know, the enterprise invoicing experience is far more complex. Your enterprise customers have tens to hundreds of accounts, charging across a slew of products and services, being consumed by hundreds or thousands of employees. Not only does this produce a heap of invoices but a mountain of usage and charge data. And every month, the accounts payable team must allocate, share, and validate the data before making a payment. But research shows that the majority of suppliers’ invoicing experiences are ill-equipped to bring efficiency to the customer’s monthly AP processes. In turn, the expectation of ‘due date’ is thrown out the window. This becomes obvious when we look at the average DSO for enterprise invoicing. A paper bill comes in at an average of 75 days. And although online invoicing offers the promise of faster review and payments, most companies still report an average of 60 days – an improvement but still far from ideal. And then of course, there’s that ‘special’ group of customers, who repeatedly take the concept of late payment to the extreme, like the 180+ day extreme. So where’s the disconnect? 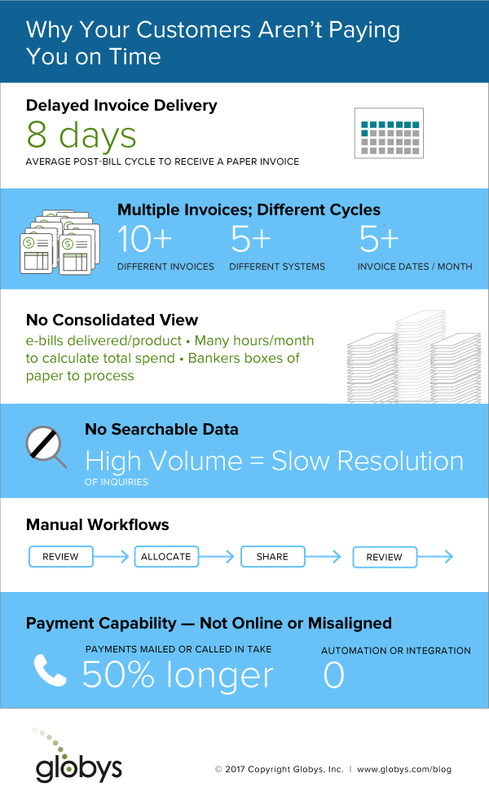 The infographic below captures six of the most common causes of late payments, and in turn, increased DSO. You’re not the only company who delays invoice delivery by 8+ days, yet still expects customers to adhere to their payment terms. See the problem here? And what about the actual makeup of your invoices? A move to online doesn’t necessarily close the gap between what your customer needs to validate and pay, and what you’re providing. Multiple invoices, multiple portals, no consolidated or editable view, no easy way to investigate a question, no way to allocate or share the information. All of these rank high in the ‘why my payment is late’ conversation. If you’re looking to improve DSO by reducing late payments, it starts with understanding what your customer needs from you in order to make faster payments easier. Learn more about the digital invoicing features suppliers are providing to simplify invoicing and payments for their customers.